Clancy's newest collaboration takes us to 2010, when the virtual Web looks like a stock-car race and gadgets and gizmos abound. 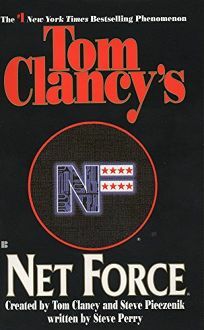 Net Force, a computer security agency created by Congress, patrols the technological etherworld and those who hook into it. When the agency's director is assassinated, Deputy Director Alex Michaels suddenly finds himself in command. Diverted by the Chechen mastermind in Russia, Michaels and his forces are soon battling the New Mafia and an Irish assassin named ""The Selkie."" Out in the field, the Special Forces carry advanced armor and weapons systems while joshing around in cartoonlike jargon. The computer jocks drive their virtual Vipers to investigate ""roadblocks"" and ""pileups."" The equipment is interesting, but the action doesn't bear up under the ponderous exposition and flatter-than-a-floppy-disk characters. (Feb.) FYI: Net Force is soon to be an ABC mini-series.